MONDAY, June 27, 2016 (HealthDay News) — Many teens are turning to risky, unregulated supplements to boost their looks, warns a leading group of U.S. pediatricians. These products — including protein powders, steroids and diet pills — are often useless at best, toxic at worst, said the American Academy of Pediatrics in a new report. Doctors are warning parents that their teens could be using unregulated supplements as appearance enhancers. A new study from the University of Iowa reinforces the connection between good nutrition and good grades, finding that free school breakfasts help students from low-income families perform better academically. The study finds students who attend schools that participate in the U.S.
Energy and vitamin-enhanced drinks do not boost mental or physical health, a damning study has claimed. In fact, many of the benefits being claimed have no foundation in nutritional science either, said the report by university academics. The only natural way to lose more weight it to burn more calories than you take in. All of these diet pills and MLM companies promoting their weight loss programs can be accomplished for free. According to new research, grabbing chocolate milk after a hard swim could give swimmers a performance edge. Researchers at Indiana University found that when trained swimmers recovered with lowfat chocolate milk after an exhaustive swim, they swam faster in time trials later that same day. On average, swimmers shaved off 2.1 seconds per 200 yard swim, and 0.5 seconds per 75 yard sprint after drinking chocolate milk, compared to when they recovered with a traditional carbohydrate sports drink or calorie-free beverage. Youth Athlete Sports Nutrition – Are You Fueled To Reach The Finish Line? 31-May-2013 by THF in Healthy Eating, Hoot's Corner | Comments Off on Youth Athlete Sports Nutrition – Are You Fueled To Reach The Finish Line? STANFORD - Two Lincoln County Middle School students were taken to the hospital Wednesday after consuming energy drinks during a field trip to Eastern Kentucky University. Principal Debbie Sims said during a 300-student excursion to the university in Richmond for a live dance performance, some students began purchasing energy drinks from a store in the main EKU food court. 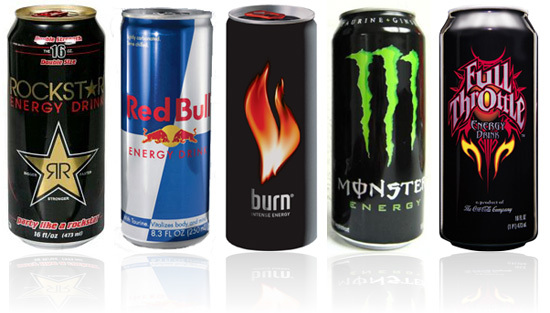 Nov. 16, 2012 — The FDA has posted adverse-event reports for two more energy drinks: 40 illnesses and five deaths linked to Monster Energy, and 13 illnesses and two lasting disabilities linked to Rockstar Energy.